onto both sides of the ribs; rub into surface. to 1-1/4 hours or until the ribs are tender. Add more coals as needed. peppers, chili powder, garlic, and dry mustard. Cook and stir over low heat for 10 minutes. 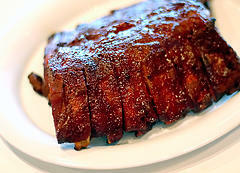 About 10 minutes before the ribs are finished grilling, brush sauce generously over ribs. Continue grilling until glazed. Pass remaining sauce. Makes 4 servings. rack, cut into individual pieces to serve.